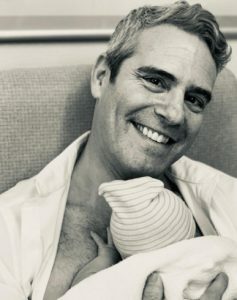 Watch What Happens Live Host Andy Cohen Welcomes His Firstborn Child! Andy broke the news himself by sharing a black and white photo on Instagram. He told his followers, “WOW! This is my son, Benjamin Allen Cohen.” Thankfully he did not make that go-to celebrity move of choosing the most outrageous name possible. He is named after my grandfather Ben Allen. I’m in love. And speechless.” Andy Cohen is speechless? There’s a first time for everything! Andy concluded that he is “eternally grateful to an incredible surrogate. And I’m a dad. Wow.” Wow is right. This is major news for Andy and the Bravo fandom. Before the baby was even born, he was the focus of the most epic party in Bravo history. Andy, John Mayer, and Real Housewives from multiple shows gathered for a baby shower. Kyle Richards, NeNe Leakes, Vicki Gunvalson, Teresa Giudice, and Ramona Singer “hosted” the party that provided premium content for all of our Instagram feeds. Hopefully, this tradition continues and the Bravolebrities gather for Benjamin’s briss, first birthday party, and any other milestone in his life. Will Andy let any of them babysit? And that was just one of Benjamin’s baby showers. Andy’s famous friends Kelly Ripa, Sarah Jessica Parker, and Anderson Cooper hosted a more low key celebration. Most likely, Benjamin has some potential Bravolebrity playdates in his future. Atlanta Housewife Porsha Williams is expecting a baby girl. Ex-Orange County Housewife Gretchen Rossi is pregnant with her first child. Shahs of Sunset cast member Mercedes “MJ” Javid is due on Mother’s Day 2019. Who will Benjamin hang with first? Will he have to mediate the arguments between the next generation of Bravolebrities on the playground? TELL US- WHAT DO YOU THINK ABOUT THE NAME BENJAMIN ALLEN COHEN? DO YOU HAVE ANY PARENTING ADVICE FOR ANDY? WHICH REAL HOUSEWIFE WOULD YOU TRUST TO BABYSIT YOUR CHILD?